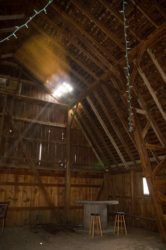 This guest post comes to us from one determined barn owner in Allen County, Indiana, and mirrors many of the renovation stories we at the NBA hear regularly, but Jessica Erpelding has the grit and grace to see through her efforts to legally and legitimately open an event barn for weddings and other gatherings–more importantly, to share the ups and downs she has faced along the way. 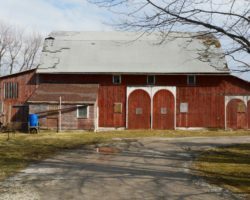 To learn more about Jessica’s efforts to save this barn and share it with her community, click here! Also, please note that we at the NBA know that not every old barn can be converted into assembly space for reasons of building codes/ zoning. 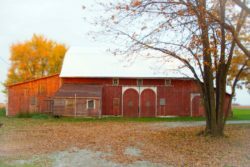 We appreciate the and applaud the successful adaptations of these buildings, but know that this type of conversion is not the right fit for many barns across the country. My name is Jessica Erpelding and this is my unexpected journey of how I fell in love with my barn and its story. When my husband and I were looking to buy our first home, we were supposed to look at another house down a block but we accidentally took a wrong left turn and stumbled upon this property that had been for sale for quite some time. We fell in love with the house, property, and the barn that was rundown but still a perk. However, we had no idea about the history of the barn until after we purchased it. The Little Red Barn Today. The bank barn is shown on a 1938 aerial picture of the property and may have been built prior to that. It was used for livestock up until Ruby and Oscar Hanefeld purchased the property in the early 1960s. They successfully transformed the barn into a popular reception hall in our area, that was in business until the late 1980s. This was no small feat. They built a beautiful hardwood dance floor upstairs by connecting the two existing haylofts. They also added onto the barn to accommodate bathrooms and running water. They even managed to heat the building and run the business year-round. At the time that Ruby and Oscar accomplished all of this, the property was located on a dirt/stone road and barn reception halls were unconventional. Interior Image Showing Holes in the Roof. The idea of bringing back this once thriving reception hall was a far-fetched dream, but a dream I was passionate about none-the-less. Over the years, we managed to replace the roof and fix the water damage. The more we fixed, the more the barn along with the dreams of its future came alive. So far, we have gotten approval from our county to go ahead with our reception hall plans. However, the codes and permits required for such a business in Indiana, especially here in Allen County, are much more strict than they were back when the Hanefeld family ran the business. The Little Red Barn was run as an “unofficial” business in the past, meaning that it was never registered with the state and there are no tax records for such a business. So we were not able to be grandfathered into any zoning regulations. 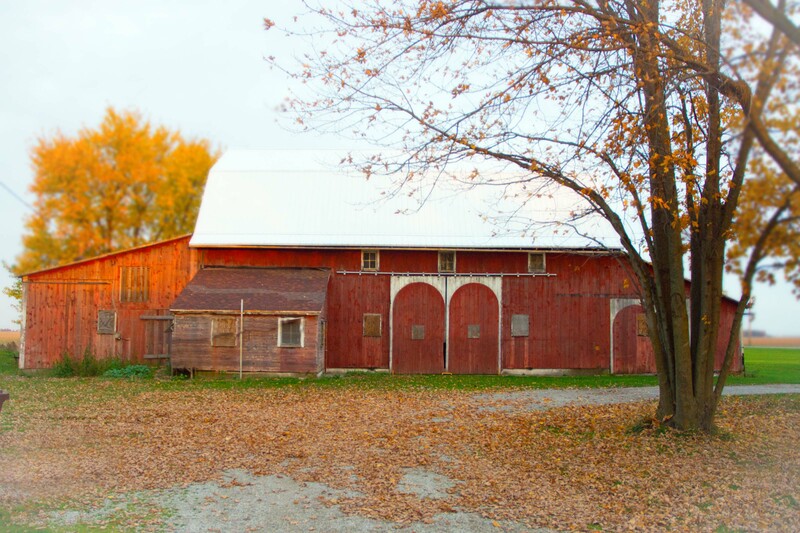 In the beginning, I assumed that we could fix up the barn little by little by charging discounted rental rates and using the proceeds as “donations” to invest back in to the barn. I put the barn up on Facebook, not really advertising that I was renting it out in October just to feel it out a little bit. The response was immense. Before I knew it I had 9 bookings in 2 months with no advertising. I thought this was great, and it was going to happen. I figured, when we got it to the point of where it was up to code, we would start it as an official business. Come to find out that everything about this plan was wrong and could have gotten me in some hot water. My husband’s uncle happens to work for the Allen County planning department. He told me that in the last year alone, he shut down three barns that were doing the exact same thing I was planning to do. They received huge fines and were closed down. One of the barns was a repeat offender and they will be unable to open their doors for another 10 years. This honestly shocked me. I asked him, “But what if I told them the people using my barn were friends or family and they were “donating” to my barn?” He said, “Jess, I’ve heard it all before and it won’t matter. Once me, or someone like me, shows up at your doorstep, the gig is up. It only takes one person to complain or report what you are doing before we show up.” I’m not going to lie, this was disappointing to hear. However, what he said made sense. It’s not just a tax issue. It’s a public safety issue. There are codes and permits required to make sure that you are and continue to stay up to a certain level of service to ensure the safety of your guests. I knew that I did not want to get fined or shut down. I still had those 9 bookings to worry about. I also knew that I did not want the IRS down my throat or have somebody injured, or possibly killed in my reception hall. So there was only one thing to do…take the big plunge! Now keep in mind that this conversation I had with my uncle took place in January of this year 2017. I had no idea what I was getting myself into. Luckily, he helped guide me to the next steps I had to take quickly. First step, get in touch with your local counties planning department. Our planning department in Allen County offers you to schedule a conference with the heads of departments such as the board of health, board of zoning, board of traffic and highway safety, etc. This is a great opportunity and take advantage of it if your county offers it. In the conference you can discuss your plans on what you would like to do and what you want your business to offer, and they give you feedback as to what applications or permits you need to implement your plans. In my case, the barn is located on an A1 zoning district, which means residential and agricultural use only. However, there is a loop hole to starting a reception hall and other businesses on an agricultural property. Per our county’s zoning rules a reception hall is allowed with approval from the Board of Zoning Appeals of a special use application. The application itself cost $350. I had to submit the application with the land deed and a detailed site plan. A detailed site plan is basically a drawing of the property and what it will look like once you start your project. You can draw this yourself or you can have an architect draw one for you. I chose the latter because I was advised that if at your hearing with the Board of Zoning Appeals, your drawing wasn’t right or missing something you have a greater chance of getting your application denied. That meant you would have to resubmit the application, another $350, and wait another month for another hearing. I wanted to do everything right the first time, so I hired a local engineer. Honestly, I would recommend this. Engineers do this for a living they know your county’s codes and requirements like the back of their hand. So, it takes out a lot of the guesswork and you are going to need one later on when you submit paperwork to the state anyways. I also found out in my conference from the department of traffic and highway safety that a parking lot is required for such a business. Parking lots here in Allen County are required to be hard paved surfaces and they usually figure 3 people per car for your maximum occupancy. My maximum occupancy is 200, so I needed a lot for 70 cars. This was way bigger than I was planning and it sounded really expensive. My uncle helped me again by telling me that there is a variance application I could submit to request gravel instead of asphalt or concrete. The application was another $350 but being allowed to have gravel would save me thousands, so I submitted a variance application as well. Second step is a hearing with the Board of Zoning appeals. This is a make or break process and is very important. The Board of Zoning Appeals (BZA) has reviewed your application and detailed site plan at this point, and this is where you plead your case. It is a great help to have the support of your neighbors and community. In most cases, this is their biggest concern. They can either approve or deny your project at this point. If your project is approved you are free to move on to the next phase, submitting applications to the state. However, if you get denied you have two choices, try again or give up your project. I had the approval of my neighbors and our mayor. The neighbor to the east of my property just requested that I have some sort of landscaping buffer put up to give him more privacy, which I found fair enough. I had our mayor write me a letter that I brought to the hearing. If you can’t get a letter from your mayor, letters from your neighbors are just as important. I am proud to say that as of March 15th we have gotten approval from Allen County to have a reception hall on the property. Now we are moving on to our state paperwork. This will rezone the barn into a commercial property once it is inspected and up to code. This part is not cheap by any means. The barn used to have a septic, but it is unusable. So, in order to install a new septic system it must meet commercial standards. To do this you will need to hire a septic designer to submit the proper paperwork to state, and a soil scientist to take samples of the dirt and survey the property for the septic designer. We have already submitted out paperwork to state and they will send me the requirements like how big of a gallon system it has to be and where it has to be located. As of now, we have a rough idea of how big it has to be and where it has to be located. Unfortunately, we have a high clay content in our Indiana soil, so the system will have to be located about 3/4 acre away from the barn itself. Needless to say, this is going to be my biggest expense. My engineer is working on the detailed drawing of the inside. This is expensive, but well worth it if you can get it all right the first time around. We also need to add another stairway to the upstairs dance floor for an emergency exit, smoke and pull fire alarms, and make it handicapped accessible somehow. When this all started, I had no idea what I was getting into. This process is very expensive and not easy, but if you take it in baby steps with stride you can do anything. We never prepped for financing because I thought I could have the barn pay for itself. I have been a stay at home mom for four years, so it’s not that I have bad credit I just have lack of it. Everything is in my husband’s name and because of this our debt-to-income ratio would be too high for a traditional business loan. So, if you are considering making this journey yourself learn from my mistake and prep yourself financially for a loan. We have been taking some steps in hopes of qualifying for a loan or financial assistance in the future. This includes cleaning up our credit scores, getting some revolving credit in the form of a credit card that I am keeping at a low balance and paying on time, and registering the business as an LLC and applying for a DUNs # to built up a business credit score. Most banks do not like to lend to start-up businesses, so make sure that you have a sound business plan. I have two. One is for potential investors/lenders, and one for traditional banks. You usually need a credit score higher than 720 in order to apply for a start-up business loan. That’s why it is a good idea to build your business credit score as well if you don’t have the greatest credit. Talk with your local banks and see what they require for business loan and make sure you tell them that it is a start-up business because they may require additional information. If you get denied, don’t be afraid to ask why. It is the only way you can better your application for the next time around. We are self-funding everything now until we are able to qualify for a loan, hopefully, in the next few months. Since conventional loans are out of our reach at the moment, I am stepping out of my comfort zone and searching for unconventional funding in the form of investors, lenders, grants, or donations. I have started a Kickstarter account as well. 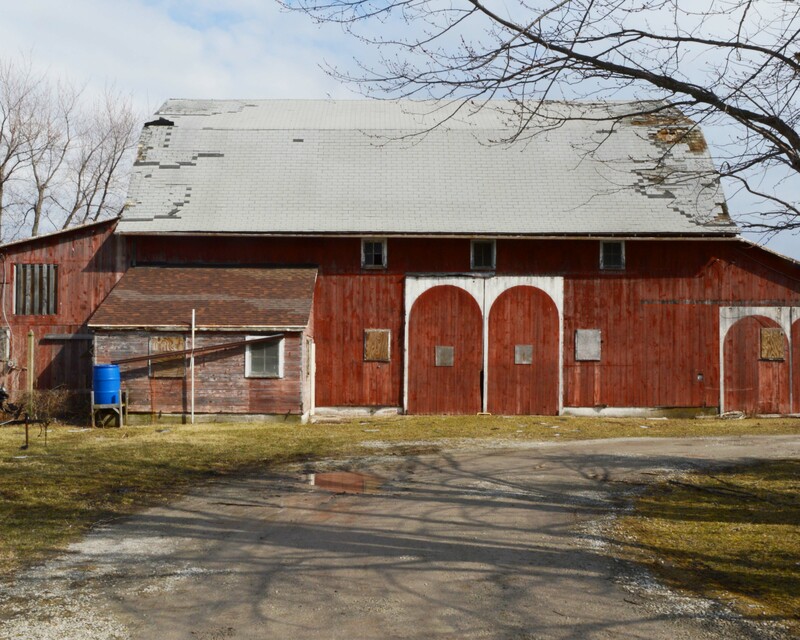 If I am successful on this platform, I think I can start a movement that inspires others like me to believe that they too can help save the precious few old barns we have left. I’m nobody special, so if I can do this anybody can. The Barn Before the Erpeldings Got to Work! The point is don’t give up. I was not in the greatest position to start this venture, but I have accomplished more in the last four months than I had ever dreamed. This IS something that ordinary people can do. My advice is to reach out to your county, community, neighbors, and family. Talk about your plans and seek advice. I know I couldn’t have done what I did if it wasn’t for the advice and support of others. You will inevitably have bumps in the road, but great things that come easy won’t last and the great things that lasts won’t come easy.